What mighty changes in that space! What revolutions on the earth! What strange events have taken place! What wonders! Since I date my birth! Come sit beneath the Hemlock tree. I’ve never felt comfortable wearing most jewelry, so when Skip first took me shopping for an engagement ring, I was really nervous. When I was a child, if we went into a store that had pricey things on display or pretty much anything breakable, my mom would have me put my hands in my pockets since I had a tendency to touch things. On this shopping trip with Skip, instinctively, my hands went into my jeans pockets. As we looked at gorgeous sparkly and giant diamonds, while I found them pretty, nothing really felt like me. Skip picked out a truly stunning ring and a diamond to match, but when I saw the price tag I nearly lost it and ran from the store. I felt a little bad being so awkward as Skip was obviously enjoying this shopping experience, so I humored him and tried on a few different rings. They felt cold and heavy and knowing how expensive they were, I felt like I needed a bubble around my hand to protect that “investment”. No doubt they were all beautiful, but it just really wasn’t my style, so we left empty handed. I had an idea of what I might like though and shared my thoughts with Skip not knowing if such a thing even existed or if it could be made. Being the amazingly supportive man that he is, he encouraged me to look for exactly what I wanted. A quick Google search led me to two websites that offered exactly what I had in mind…something natural, organic and earthy. Rings made of wood. 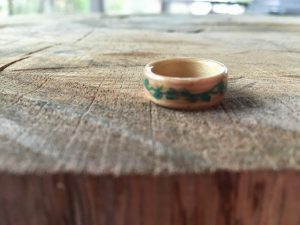 Since it was the Red River Gorge and the outdoors that brought us together, what better way to celebrate our relationship than to have rings made from wood from the place we met? One of the companies we found, Northwood Rings, can custom make rings from the materials you send to them, and we knew immediately what we would choose. My favorite tree has always been the Hemlock with it’s gracefully feminine evergreen branches and woodsy scent. When we first started dating, I was delighted to learn the Hemlock was also Skip’s favorite tree and also the name we chose for our business. The Hemlock is also known as the “Tree of Faith” and is symbolic of family, tribe or community, and healing. We chose a piece of a recently downed Hemlock as the inner layer of the rings; the one that would be closest to the skin. For the outer layer of the rings, we selected a remnant of one of our Douglas Fir beams from the barn. The Douglas Fir is known as the “Tree of Strength” and is symbolic of past and future. Like most evergreens, both the Hemlock and the Douglas Fir are flexible and will bend before they break. They are some of the longest living evergreens, perhaps because of this flexible quality and something that we felt was important for a marriage. Both trees maintain their deep green needles throughout the year symbolizing enduring love…another important marital quality we wanted to be reminded of. 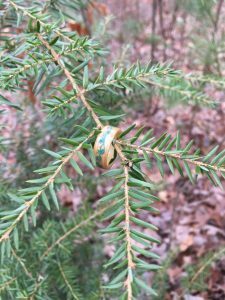 To this end, we had a dear friend, Tim Yates, design a Hemlock branch that would be engraved on the outer layer of my ring and inlayed with crushed malachite. Though unconventional, we couldn’t be happier with our choice. Our rings hold much meaning and symbolism for us and serve as a reminder of the place we call home no matter where life takes us. 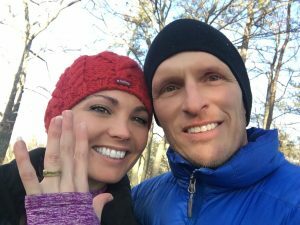 We would love to hear of any other couples who have chosen an unconventional ring, so please leave us a comment and tell us your story! Hello there, You have done an incredible job. I will certainly digg it and personally recommend to my friends. I am sure they’ll be benefited from this website.